FenwayNation—Red Sox, Mookie, J.D., Bogaerts, Sale, JBJ—Founded 1/27/2000—9-Time Champs: Red Sox '18 World Series Championship 'Bubbly' Now Available For Purchase! 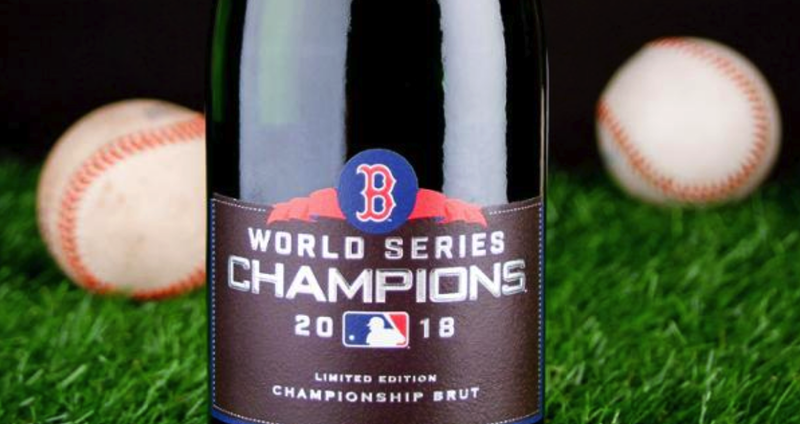 Red Sox '18 World Series Championship 'Bubbly' Now Available For Purchase! If you were a little jealous when your 2018 Red Sox were spraying themselves with bottles of champagne, you can now rest easy. Wine by Design, the exclusive wine licensee of Major League Baseball, has released a premium, limited-release World Series Championship Brut (that's sort of like champagne for those of you living outside Route 495). For the wine snobs among us, the bubbly is made in "the true French Méthode Champenoise style" and is, "rich and complex with fine bubbles, highlighting premium grapes grown in California." Oy! Wait, there's more pretentiousness from the official release: "This wine is truly worthy of repeat champions like the Boston Red Sox, fresh fruit aromas of yellow delicious apple and citrus flower nuanced with tropical notes on the nose. The taste follows through with citrus that livens the palate—begging for another taste". Yeesh, could they possibly be any more insufferable? Anyway, be sure to rush out and buy yourself a bottle or two—even just for the cool label. In fact, only for the cool label.